Thank you to all of you who supported our neighborhood last night by attending National Night Out. We had a great night of music (Thank you, Beetle! ), food (Thank you to our food sponsor Papa Mio!) and celebration (Thank you to our great neighborhood sponsors- David Houston -New Leaf Real Estate, Jerry Blum- Heritage Texas Properties, Cliff Helmcamp- Greenwood King Properties) Thanks also to Reprint! for sponsoring a portion of the printing of all of the cards and the great banner. Our next GENERAL MEETING is at Zoe’s Kitchen 7-8pm Tuesday, November 12. Hope to see you there! 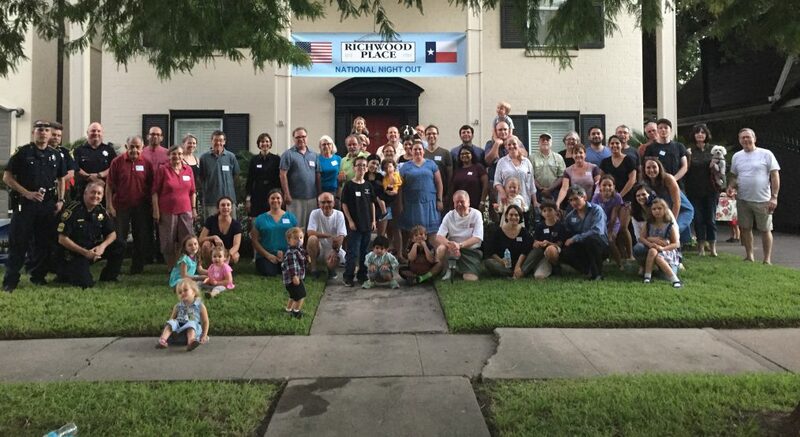 This entry was posted in Events, Uncategorized and tagged houston, NATIONAL NIGHT OUT, NNO, richwood, richwoodplace richwood place civic association, texas national night out. Bookmark the permalink.